The star attraction of Nuit Blanche, the annual all-night art festival at which Buffalo artists took center stage on Saturday night, is the City of Toronto itself. Because the night featured so many projects -- from otherworldly sounds emanating from the ruins of a demolished parking garage to a spread of intense, rainbow-colored lasers shooting across the city from the observation deck of the CN Tower -- a walk anywhere within the downtown core yielded a dizzying series of encounters with beauty or wonder. After taking in a few installations or performances, the entire city begins to open up for inspection. You start to wonder what's art and what's not -- whether that extraordinary piece of architecture had just popped up tonight, or whether a sprinkler system gone haywire on Front Street near the train tracks was in fact part of some semi-secretive art installation. After seeing a few dozen of them, you stopped caring where the festival ended and where the city began. In the same way that John Cage's work opened listeners' ears to the natural rhythms and cadences of their surroundings, Nuit Blanche and other city-wide visual arts events serve to make festivalgoers more attuned the visual beauty and intrigue that surrounds us every day. This is the central use of art: to jolt us into recognition of what surrounds us, to heighten our awareness of the world, to feed our curiosity. This installation was kept under tight wraps by "Performance Anxiety" curator and former Buffalonian Heather Pesanti, and for good reason. The piece was presented as a PR campaign from a business partnership between American and Canadian energy interests. It featured an enormous video screen flanked by two towering oil barrels in the middle of the reflecting pool at Nathan Phillips Square. Throughout the evening, National Geographic-worthy footage of verdant mountains and wheat fields was juxtaposed with feel-good buzzwords played on the screen with a kind of soothing soundtrack -- a successful attempt to send up the impossibly cheery and sunlit advertisements of companies such as BP or America's Natural Gas Alliance. The star of the video was a perfectly poised woman, the fake company's director of PR, who delivered a speech so politely sinister and eerily Orwellian that it sent chills down my spine. At a certain point, around 11 p.m., the situation completely broke down and one of the tanks sprung a leak. The square's fountains, which normally spurt clear water, turned a dingy and finally dark brown as hundreds of gallons of brown food coloring stored in tanks behind the stage flooded into the pool. Later, graffiti taggers materialized to turn the pristine white tanks into canvases for spray-painted skulls. This is the kind of deeply funny, somewhat heavy-handed but extraordinarily effective brand of institutional critique for which the CAE has long been known, and the project had to rank as one of the night's biggest surprises. I was told that organizers enlisted the Toronto Fire Department to do a staged "cleanup" of the staged oil spill, but I had moved on to other parts of the city before the engines arrived. This installation, tucked into a pocket park along Spadina Avenue, had the longest line of any piece I saw all night. It was made up of hundreds of inflated globes of various sizes attached to trees to form huge overarching canopies. The entire piece was illuminated by intense lights, which went from cool blue to blazing red, changing the mood from wonder to menace in the matter of a few seconds. The sheer scale of this work was what was most impressive, especially in its central canopy, in which people stood for long minutes craning their necks to take in the world of worlds they'd just entered. "The tour of 'Walk among worlds' is a contemplative ride to the center of the Earth, which by immersion drives to a reformulation of our understanding of it," González, who is Argentinian, wrote in his statement. "The world correctly conceived is not one and only, it is an accumulation of parallel worlds: some more visible than others, some closer or more distant from others, but all part of the same organic vital structure. 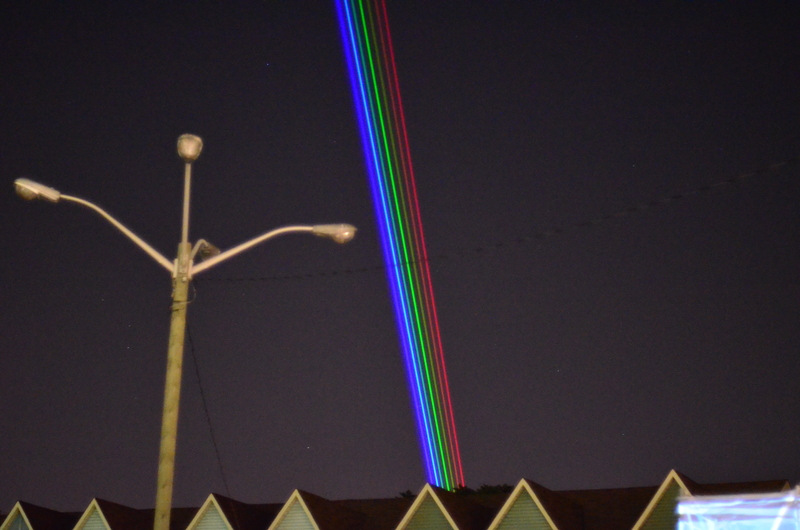 Yvette Mattern's light-based installation is nothing more than a series of extremely high-powered lasers representing each color of the rainbow mourned to the observation deck of the CN Tower. But the effect is anything but simple. Depending on where you were in the city, Mattern's lasers either looked like a crazed searchlight shooting out of the CN tower, or some kind of mystical emanation into the heavens from the city itself. From one spot, I was convinced the lights were based on the ground, whereas from others it was clear they were shooting down from the city's best-loved piece of architecture. The constant but unobtrusive presence of the thing -- its existence as a reassuring backdrop to all the night's activity, like the sky or the stars, was what I liked best about it. You sort of wished it could be made permanent. Toronto's City Hall, designed by the Finnish architect Vijo Revelle, is one of the most spectacular civic buildings in North America. Most people know it by its two central curvilinear towers, which look like something out of Stark Trek. But the inside of the building also holds its own fascinating architectural accomplishments, one of which, the building's central column, was the focal point of a subtle but moving vocal performance by Los Angeles-based artists Kathryn Andrews and Scott Benzel. As part of the piece, the column served as a 360-degree screen for a projection featuring choral singers. Aligned along the circular balcony were actual tuxedoed choral singers, who took turns singing meditative hums that reverberated through the space. While I was there, a couple of young men who had come to see the show took the opportunity to sit in front of the column and meditate, which probably would have pleased the artists very much. If we are the sum of the decisions we make, this simultaneously DIY and high-tech project by Labspace Studio out of Toronto is the adding machine. Would they rather enter the past, present or future? How many regrets do they have about their lives? Would they prefer more mystery, or more certainty? With each push of the door handle, those decisions registered on a screen at the end of the installation, on which the entire night's results were tallied in a kind of rotating infographic. When it comes to "carpe diem," no one was better at broadcasting that particular message than Buffalo's own Shasti O'Leary Soudant, whose "HALFLIFE" exhibition -- about which I've written a good deal -- was clearly one of the most popular and beloved aspects of this year's festival. During the height of the event, there was not a street corner in the vicinity of the square from which one of Soudant's "carriers" was not visible. Each one was encircled by a mini-mob of curious art-goers, each of whom waited his or her turn to be dabbed on their hands and faces with dots of invisible ink. The success of this performance -- which explores the mounting fear of human contact in the age of the iPhone -- comes primarily from the ingenious helmets Soudant created using laser-cut sheet metal, Day-Glo orange paint and blinking LED lights. You couldn't come near one of them without instinctively craving to know what the story was, at which point, if you were like most Nuit Blanche attendees, you immediately fell in love with the project. It all ended in a midnight convocation, to which perhaps a thousand people came, covered in dots of invisible ink that glowed faintly under a series of backlights. I found Soudant's message about the need to connect and to fight against our fear of one another somewhat anticlimactic, delivered in the style of FDR as filtered through Karen Finley and shorter on poetry than I had expected. But that's little matter because "HALFLIFE," as a piece of absurdist theater with a deeper message we all desperately need to hear, was a resounding success. There was something instantly funny, disconcerting and joyous about these palm trees with cherry picker trunks installed at a busy intersection along Queen Street. A great sculptor knows inherently how to combine elements that look exactly right together, if only because they look exactly wrong together. This juxtaposition of industrial machinery and natural flora calls up all kinds of associations about the environment and about the design of cities. Mostly, though, they were just a refreshing sight on a chilly night. In this exhibition at Fort York, hundreds of light bulbs lit up in time with an entrancing soundtrack. The bulbs, like fields of quickly blooming flowers, seemed to pour out from the cannons at the top of the historic fort, bringing the landscape to life in a way that looked like a city viewed from an airplane at 35,000 feet. I didn't watch nearly as much of Buffalo artist Kyle Butler's performance as I would have liked, but what I saw was fascinating. The project consisted of 12 episodes during which Butler, with the help of a team of assistants, constructed, deconstructed or interacted with part of his pre-built set according to an elaborate script. During the section I saw, he reenacted the household ritual of cleaning up after dinner by dropping plates and casseroles into a metal sink he had just dragged out onto the floor. For Butler, there seems to be something ever-suspect about the built environment, especially in the way it influences and alters our behavior. The way we use a kitchen table, for instance, flows directly out of the way the table is constructed, and even though we may not be inclined to cook, we feel the compelled to do so. His work operates on many levels, but the part of it that has always struck me is its the hair's breadth line it walks between order and chaos, decorum and delirium, freedom and a kind of invisible enslavement. I got the sense from this section of Butler's performance that he was portraying some feral creature forced by social laws and structures to act in a way that was obviously foreign to his nature. Throughout the show, with microphones attached to his wrists so you could hear the sound of building or destruction amplified through the square, he brought pieces of the inside out and the outside in. The result was confusing to many viewers in the instant, but fascinating in the context of Butler's young career. I hope he repeats this performance, or builds it out into something more, in the future. Colin Dabkowski – Colin Dabkowski is a digital editor for The Buffalo News. Before that, he was The News' arts critic, responsible for covering visual art and theater in Western New York.